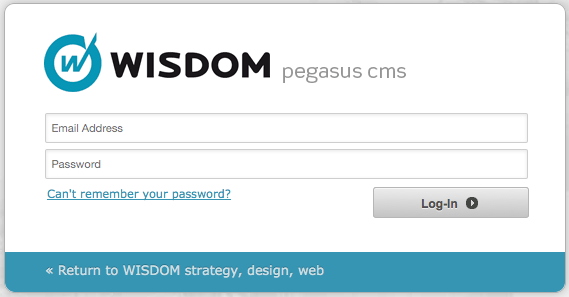 To request a change to your website, please contact your WISDOM account manager directly. If you are unsure who your account manager is send your change request to info@wisdom.com.au or call 02 4226 5655 and ask to speak to your account manager. Restarting your web browser or computer? Doing a hard refresh of your web browser by holding the shift key and clicking on your browsers refresh icon? Checking if your website looks correct in different web browsers or computers? Checking that the URL you are using is correct? Checking that the URL is using http:// and not https://? The URL with and without www at the start? Checking if it is working in different web browsers or computers? Is the form emails being marked as spam or junk? Is the email address setup to receive the form submissions setup and receiving correctly? Checking you are using the correct email address that was used for the Pegasus CMS? Checking your email address and password is entered in correctly? Entering in your email address in all lowercase? Typing in your password rather than copying and pasting? Clicking the forgot my login link that appears after a few seconds on the login screen? You are using the correct URL to login? You have a Pegasus account setup for your email address? You can reset your Pegasus CMS password by clicking on the "Can't remember your password?" link that appears after a few seconds on the Pegasus CMS login screen. Checking you are using the correct URL for accessing the Pegasus CMS? Updating your web browser to the latest up to date version? Using a different web browser or computer? Reading the online Pegasus CMS manual and making sure that you are using the Pegasus CMS correctly? Checking you have the correct Pegasus CMS user privileges? Reading the online Pegasus CMS User Guide and making sure that you are using the Pegasus CMS correctly? You can access the online Pegasus CMS User Guide by clicking on the icon in the top right corner of the Pegasus CMS toolbar. Checking the original settings that were provided to you are what you have set in your email program? Checking that your email password is correct? Tried using webmail if this is available to you? Checking that your domain has not expired and renew it if this is the case? Checking that you actually have emails hosted with WISDOM and not a different email hosting company? Checking that your Internet connection is working correctly? Can you currently browse to different web sites? Checking with your IT department that there have not been any network changes recently that may have affected emails? Checking with your IT department if your emails are being filtered or blocked at your network level? Checking if your emails are being marked as spam or junk in your email program? Checking if you are using your Internet Service Provider (ISP) for your Outgoing Mail Server that these settings are correct as provided to you by your ISP? Please provide all information required for us to help you with this issue. Include all steps you are taking and the browser version and operating system you are using (as displayed at the top of this page). If possible please attach a screenshot of the issue or error message you are seeing. Using Windows, press the Windows logo key + PrtScn button. The screenshot image will be saved as a file in your Pictures > Screenshots folder. Using Mac, press the Apple key + the shift key + the number 3 key. The screenshot will be saved as file on your desktop.